As a parent, you’re probably aware of (and maybe even offended by) color coding stereotypes for children’s toys. The predominant colors for toys for boys are the bold ones, especially red and black. For girls, their toys tend to use more of the pastel colors, with pink the most famous girly girl color of them all. 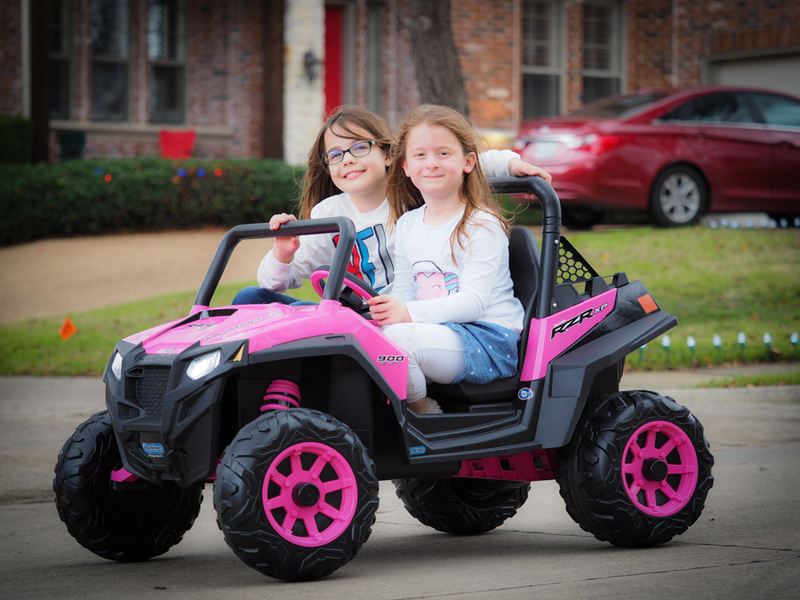 But with this Pink Peg Perego Polaris RZR 900, you may want to rethink any negative connotation of pink girly girl toys. There is nothing “girly” about this awesome toy car for girls. The boys in your neighborhood are going to want to ride it too. You may be thinking that the Peg Perego brand seems familiar, because you have used other Peg Perego products. They are known for all kinds of products – strollers, high chairs, car seats, and lots of ride-on toys. This brand is from Fort Wayne, Indiana, and they’re known for the high quality of their multifunctional children’s products. So it shouldn’t be surprising that this particular ride-on toy demonstrates the same superior qualities. The Peg Perego principles involve making items that are easy to assemble while exhibiting long-lasting durability. 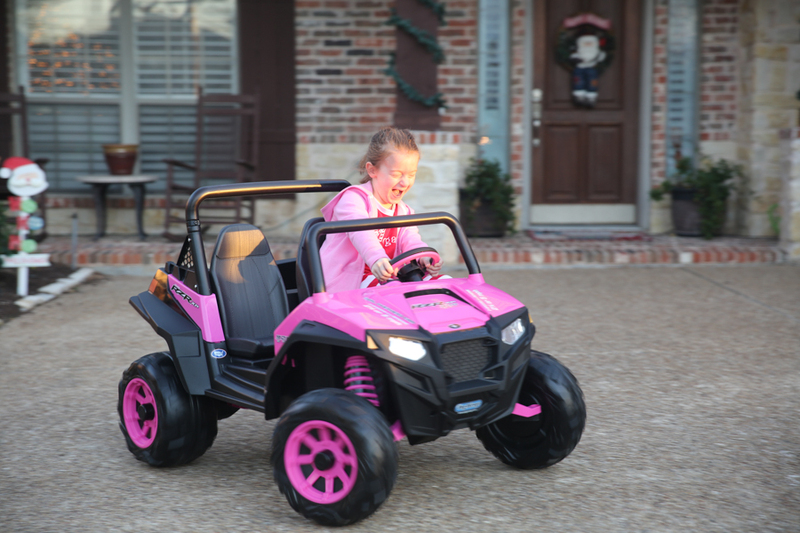 They now offer items for little kids, and the Polaris RZR 900 is an example of their dedication to quality. This is Christmas morning happiness!! What’s the Polaris RZR 900? It measures 50 inches long, 36 inches wide, and 34 inches high, and it weighs 61 pounds. It’s powered by a rechargeable 12V 12Ah sealed lead-acid battery, which fortunately is swappable. It also comes with a 12V charger, which you can replace with a supercharger alternative for faster recharging. It comes with 2 forward speeds: 1st gear allows for a speed of 2.5 mph while 2nd gear goes for 5 mph. It comes with a lockout feature that disables the 2nd gear if you’re worried that your little tot is going too fast. It can also go in reverse, with a speed of 2.5 mph. It’s a two-seater vehicle, and the seats are adjustable for growing children. It comes with all the design elements of SUVs, including a windshield and a roll bar. It also has a big sport bed along with the tie-down anchors for cargo. There are even cup holders. The plastic wheels offer excellent traction for “off-road” surfaces. It’s recommended from ages 3 to 8 years old, with a maximum weight capacity of 130 pounds. You can also get the optional Adventure Trailer, just in case your kid wants to haul stuff around. You can go online the the My Peg Perego Parts Website and find other add-ons for your vehicle as well. The Polaris RZR 900 comes partially assembled, but you can check out the manual to see just how you’re going to put this thing all together. For most people, it’s not terribly difficult to do, although it may take some time. If you’re alone, it shouldn’t take more than an hour. Santa brought our car fully assembled, but we have heard other people tell us that assembly is not bad at all! In general, the assembly for the actual vehicle will actually take less time than putting on the various decals. All you’ll really need is a screwdriver and some pliers, and some familiarity with DIY assembly. Once you get all of that done, you can work on the crazy decals. And if you’re like me, that will be the hardest part, because it makes me crazy if the decals are not perfectly straight! Once that’s done, you need to charge it, and that can take a while with the standard charger. In fact, the manual says it’ll take 18 hours! You may want to do this at night so by the next day you’re all set to go at any time you want. 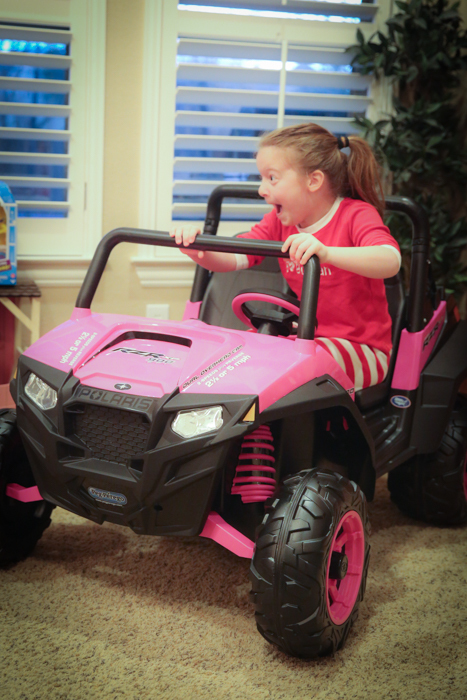 She couldn’t wait to get her pink Peg Perego outside! She threw on a jacket over her PJs and drove it around the driveway! For children, driving this baby is a snap. It’s absolutely not a big deal. Your child can just hop in, put it in gear, and step on the pedal. You may want to put the lock on the 2nd gear when they first try it out, so that you can see for yourself that he/she knows how to handle themselves going forward and driving in reverse. Going forward shouldn’t be very difficult to learn, since even very young children know about turning the steering wheel to the direction they want. Just make sure that they know to look ahead to while driving. This was difficult for Morgan, because she was always looking back at us waving goodbye as she zoomed down the street away from us. But…it only took crashing in to the curb a few times before you understood how to avoid those pesky curbs! After they master driving forward and reversing when they need to, you can unlock the 2nd gear so they can go full speed. They won’t have any trouble finding it, and then they can go a bit faster. Don’t worry, because 5 mph isn’t really all that fast anyway. It’s like the speed of a brisk walk. But in Morgan’s little imagination, she is zooming down the freeway, going much faster than the speed limit. The Peg Polaris has great shock absorbers for when you are crossing through grass fields and paths. It also drives well on gravel, along with blacktop surfaces and even somewhat “rough” terrain. The plastic wheel offers good traction on most of these various surfaces, although wet terrain may be a bit harder as the tires sometimes slip. The weight of the driver adds traction to the vehicle, which is why very young kids sitting alone may just cause the wheels to spin out. It’s also not a good idea to use this indoors, as the wheels may damage the flooring (however, I can’t say that we followed this advice). Our floors are fine, but all the marks on the walls from when she was learning to steer took some scrubbing to get off!! It was tough getting good pictures – she was going at full speed ahead, and kept almost running me over!! There may be some cases when the wheels do spin out when it’s driven outdoors, such as when it’s stuck in the muck and mud. When that’s the case, the vehicle’s overload circuit breaker will disconnect the power automatically. You can fix the overload condition (lifting the vehicle from the muddy part of the track, for example) and you can try again after 10 seconds. If you’re going to be near traffic, you might consider attaching a safety flag so the Peg Perego is more visible to passing cars. What’s more, kids may not want to be confined in their own backyards. The park is probably best, especially when you have bike paths, jogging paths, or playing fields for baseball and football – these are all very good, safe spaces to drive on, especially if your child is just learning to steer. It’s a bit like having your kid ride a trike, except that they don’t get tired at all. It will take them a very long time to get tired of using this vehicle for fun and play. Start them at 3 years old, and by 7 or 8 they’ll be excellent drivers! As a parent, you may feel a bit alarmed that there’s no standard seat belt for this 4-wheeled vehicle. There aren’t even any brakes! Isn’t that unsafe? The answer to this is an unequivocal no. In fact, it’s actually very safe (and fun). What you have to understand is that it’s a very slow-moving vehicle. At its maximum speed it’s no faster than a brisk walk or a very light jog in a pace when a regular runner is slowing down at the end of a run. This slow pace is the key to its safety. It’s slow enough that kids even as young as 3 years old will have enough time to maneuver the vehicle from hitting things. And even if they do hit something, they won’t get injured at all. And believe me – Morgan has crashed into quite a few obstacles. It’s always the speed that poses the greatest danger for little children, which is why fast bikes and skateboards are so dangerous sometimes. Then there’s also the temptation of doing various tricks and jumps. All these risks don’t apply to the RZR 900. It’s heavy enough that it won’t tip over, and stopping the vehicle is easy enough to become instinctive. For passengers, there are also some bars on the dashboard they can hold on to. So all in all, it’s safe. It meets all the all ASTM (American Society for Testing and Materials) Toy Safety Standards. 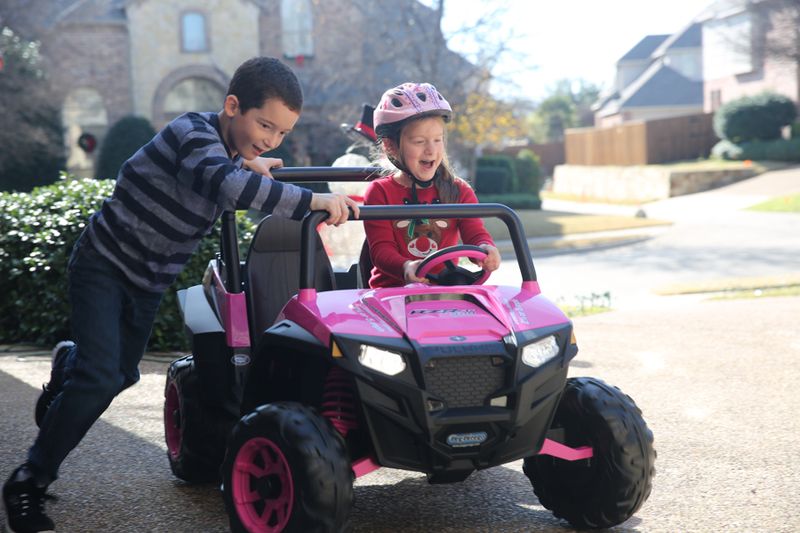 With the Polaris RZR 900, even your very children can imitate the adults around them by driving themselves around. It’s one of the reasons why young kids will love this even more than a trike. It’s a very good way to gain some sort of independence, and it’s also a good way for you to teach them about driving properly. They can learn a lot of good habits through this, and with fingers crossed they can develop these habits so that they can apply them when they start driving for real. Avoid obstacles. Here’s the number 1 rule with cars that also applies to the RZR 900. Don’t hit people and objects! While some kids know this instinctively, others may have to be taught. For sure, it a lesson they will absolutely need when they drive a real car. Proper handling of the steering wheel. Here you can teach them about always having 2 hands on the wheel. This is the mantra they need to keep in mind throughout their adult life. Looking at where you’re going. Many traffic accidents these days are caused by inattentiveness, and by not stopping when they can’t see much ahead. With this vehicle, you can teach kids to always look ahead and to see where they’re going when they make a turn or go in reverse. Stopping the vehicle. When driving in a real car, you should take off your foot from the gas pedal when you’re unsure about what’s ahead. With the RZR 900, that action stops the car, so it’s a good habit to develop for later. Your kid can also learn to stop the car completely before going in reverse, or before the passenger gets off the vehicle. Parking. You can also teach your kid about parking the car in its proper place. When they’re slightly older, you can even give them a head start with parallel parking! Operational range. As your kid grows up, they can learn about how long they can use this car with a full charge. So that means they can learn to anticipate when it’s time to go back home, by gauging how long it has been since they first started. Even enough room for her to drive around with a passenger! The first rule of maintenance for this is that the vehicle should be protected from watery conditions. So don’t ever let it be used near a swimming pool (or lots of water). It should also be parked under a roof so that it doesn’t get damaged from rain and snow. Then you can just take care of the car by wiping it down with a damp cloth so that it looks shiny and new. We keep ours in the garage. Every now and then you may want to use a light weight oil to lubricate the wheel bearings, the linkages in the steering, and other parts that rotate or touch each other. You should also check the battery system and the charger. If something’s not right, you need to replace the defective part. Don’t try to repair it yourself, especially if it involves the electrical system. A spare battery and the super charger – These options are virtually mandatory if you really want your kid to maximize their enjoyment. A seat belt system – There’s no such thing as too young to learn about strapping yourself in a car. As a responsible parent who drives their daughter around in a car, you always check that your daughter is always wearing her seatbelt. But now she can learn to habitually do this herself. A horn – This is much better than your kid screaming “Get out of the way!” at everyone around her. Get one with a gentle sound, not one that’s obnoxiously loud. You don’t want to use this on any road where cars regularly drive by. But just in case, these LED lights can at least make the vehicle more visible. Bicycle tire treads – This can be a pain to attach, but at least you can get better traction than the one you get with the plastic tires. Personalized plates – It reinforces the idea that the car is hers, so she’s more motivated to take care of it. Also, the plates can help avoid any confusion if there’s another girl in the neighborhood with a pink Peg Perego Polaris RZR 900. A roof – When the summer sun gets too hot, a roof can help with too much sun. For the kids, the good thing about it is that it’s fun. And that fun can last for at least 2 hours at a time, which is great for an electric vehicle like this. With a spare battery, you can stretch that to 4 hours. That’s plenty of time to really have fun before the kids get tired. It goes fast enough when you’re riding on it, and at the same time the controls are easy to learn. Kids can play act like they’re adults, and at the same time they can learn about responsible owner and driver skills which will be of much use when they grow older. For you parents out there, the most important thing about this is that it’s slow enough to be really safe even with collisions. It’s very stable because of its design and weight, so there’s no risk of turning over. It’s also sturdy enough so that it’s not damaged when your daughter bumps into things at first. It can get annoying if you have to pay for repairs every time there’s an “oops” moment with the car. It’s also great that it has 2 seats, because if you have two kids then they can go together while they take turns. There isn’t one kid on the sidewalk feeling left out. That should save you a headache trying to referee kids about whose turn it is to ride. There’s really no way to buy this directly from the manufacturer website, as they will direct you to their retailers instead. But there are some online retailers ready to accept your order. This normally retails for about $400 on sites like Walmart.com, but you may get a discount from other sites like Amazon (see link below). As it’s expensive, most families won’t be willing to buy one for each kid. But at least they can learn to share. Perhaps the most annoying problem is that the wheel often loses traction on various surfaces, but a bike tire tread add-on can help with that. NextThe DJI Phantom and Other Drones…What’s All the Fuss About?